What's the Best Charcoal to Use for Smoking? Good charcoal for smoking lasts a long time and produces a steady high heat. Purists use hardwood logs, but most people use charcoal to give food its smoky flavor. Of course, not all charcoals are created equal. Learn the difference between briquettes and lump charcoal and which kinds are best. Charcoal should be as basic and as clean as possible. If you are buying inexpensive charcoal, look for one with no additives. Avoid self-starting charcoals that have lighter fluid additives to get them burning. These leave a bad taste, are bad for the environment, and are just not good for any kind of cooking. The lighter fluid must burn off before you can cook your food, so you can't add more of this type of charcoal during the cooking process. If you haven't gotten the knack of lighting charcoal, there are several charcoal starters you can use, such as a charcoal chimney or an electric charcoal starter. Also, avoid charcoals that promise things like "authentic mesquite flavor." You can add real wood for smoke flavor. Charcoal shouldn't come in flavors. Briquettes are a good choice for your smoker, provided you get the cleanest versions possible. Much of the charcoal sold is pressed sawdust formed into briquettes. These generally use a natural, sugar-based binding agent that burns clean. Many cheaper brands add anthracite or coal to the mix for better, hotter burning. Coal is not a good fuel source to cook over but it doesn't affect the flavor much, and it is used in very small amounts. 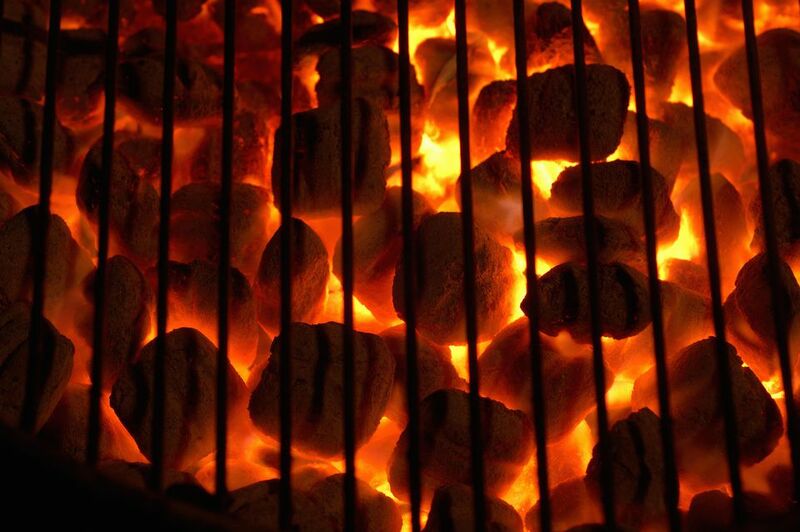 Briquettes maintain a steady temperature and typically burn longer than lump charcoal. However, they take longer to light. If you want to step up a level, you can use lump charcoal. This is actual pieces of wood that have been fired into charcoal. Lump charcoal made from hardwood is as close to smoking with hardwood as you can get without splitting logs. It has much more authentic and flavorful smoke. Lump charcoal burns longer so you use less of it. While it costs more, it isn't overly expensive in the long run because you use less. Lump charcoal is also more available these days and can typically be found in places that sell smokers and outdoor cooking equipment. The burn time and the amount of heat lump charcoal puts out vary by brand, so you will have to see how each kind works in your smoker. The size of the chunks also varies. Lump charcoal typically burns cleaner than briquettes and produces much less ash. It also burns hotter, but you can control the temperature by using the adjustable air vents of your smoker. Once you buy charcoal, you need to store it properly. Charcoal can easily become contaminated in the garage. Place it in an empty trash can or storage bin and close the lid to protect it. Of course, charcoal must be kept completely dry. Damp charcoal not only doesn't burn well, but can grow mold that will produce a harsh flavor in the smoker.